I am producing a book on 2-sided A4 pages. In the past I have printed these and used a comb binder. I have been offered an opportunity to print on A3 sheets and stitch. It is an attractive option. Is there any software in Publisher that will arrange the pages for printing in this way? Likely to take a week or so. Yes, it's in the print options > Click on "Range and Scale" and select "Document Layout" from the pulldown menu. In the appearing "Model:" pulldown menu select "Booklet". Stitching usually involves signatures. Ask how the printer wants the pdf. 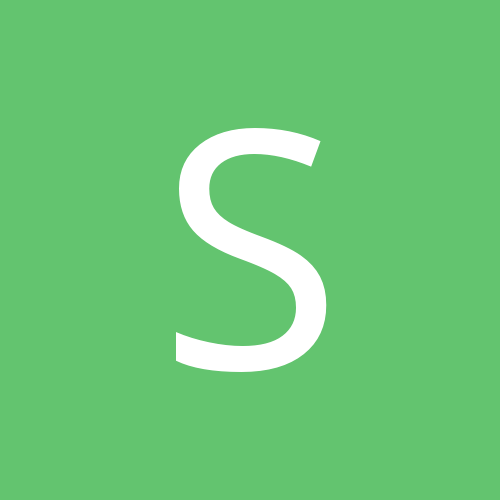 They should be producing the imposition from a pdf of single pages, which will arrange the pdf in signatures of 8, 12, 16 or whatever multiples of 4 pages. Thanks both. Most informative. It is something I have never doe before and at my age (77) having difficulties getting my mind round it. You might try it first with just a few pages, lets say 8. To get 2 sheets (4 pages on each sheet). • on the stack's bottom: the Title page + last page. • when folded, the inner sheets protrude from the stack on the edges parallel to the fold. You need to cut the folded stack to make the pages easy to turn around. So far so good -well almost! I have a friend who has an A3 printer. So the easy option is to get a driver for his printer. and install it on my computer It is an OKI C9000 . But if I try to download the driver for this printer it will cost $10 with no guarantee it will work. This would mean connecting my computer to his printer. If this explanation is not clear enough, I will try to produce a video demonstrating the problem. Plse let me know. By the way, the sketch image crossing the two pages does not copy easily. That is a separate issue which we solved by another means. For the moment,leave that to one side. With regard to the overset text, isn't the solution there to click the eyeball icon at the lower right edge of the frame to hide the overset text, and then to click the red arrow icon at the edge of the frame to then manually re-thread the text through the remaining pasted text frames? 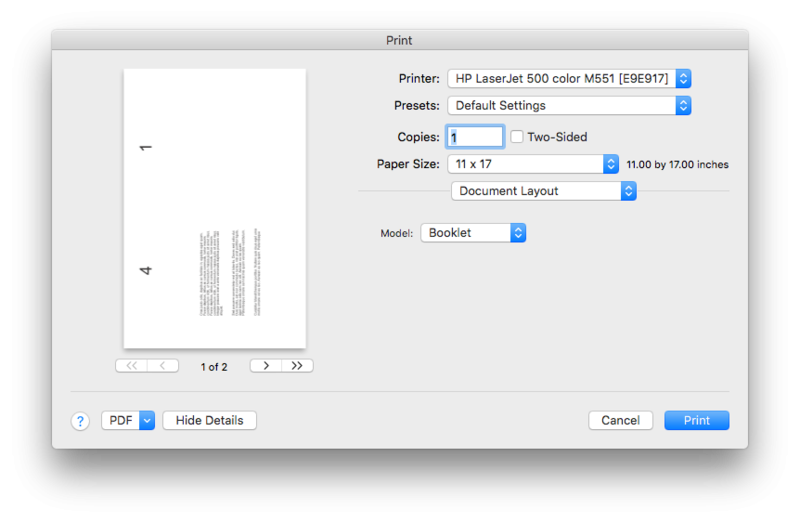 Having said that, it is probably wiser to use the print command to produce a properly page-imposed PDF. 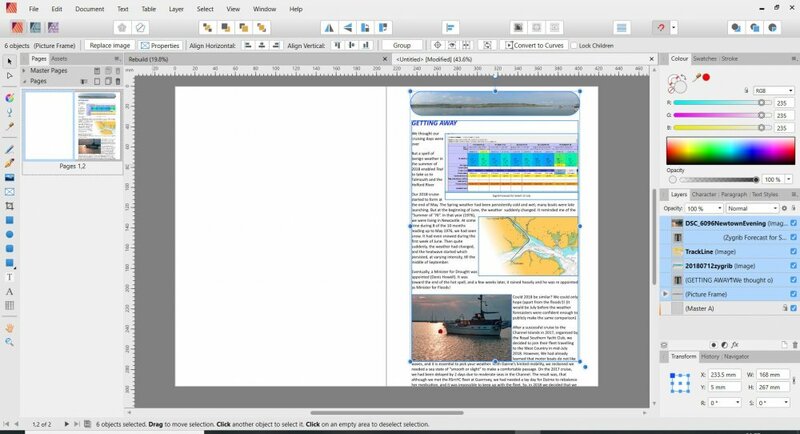 Begin with your original Publisher document composed of facing pages of A4 sheets. 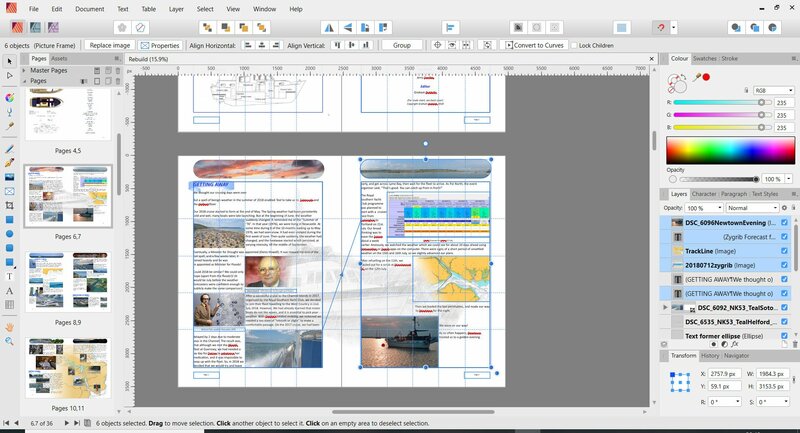 In the print dialogue box, make sure that you've selected a sheet size that matches your spread dimensions (In my case an 11x17, in your case an A3). Under Document Layout options, make sure that you set the Model option to either Book or Booklet. If you have this option in the Windows print dialogue box, under the PDF pull-down menu, select "Save as PDF". Thankyou. 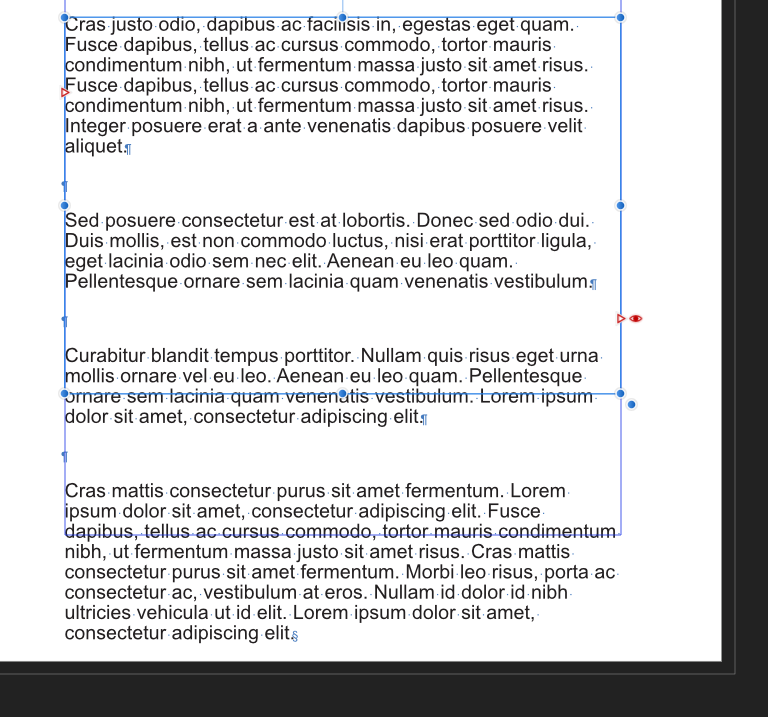 It looks incredibly simple, except I do not have what you call "The PDF pulldown menu" . Where do I get that? Good question. I'm not familiar with the Windows interface. 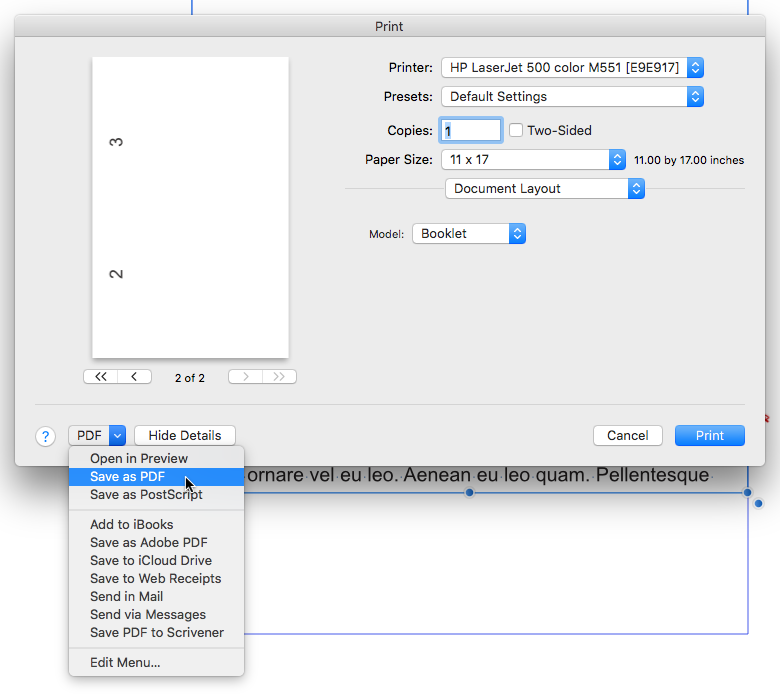 Perhaps through trial and error (or via Help files), you can discover a way to "print" directly to PDF. Or, even better, perhaps one of our fellow members who uses a Windows machine can point you in the right direction. You have indicated that there is a door there somewhere. All I need is someone to show me where it is! Are you sure the OKI printer driver does not have booklet feature? You could just export your item as normal PDF pages and use PDF Reader to print if driver allows you to print the PDF as booklet. I'm happy to have found the instructions for printing a liltte booklet for myself in this thread. Graham, where the heck is your 'save as PDF'-button? You don't need to select a printer, for me 'no printer selected' works fine. I wish I knew! Are you using a Mac? I am on Windows. If you are on Windows 10, look for a printer named "Microsoft Print to PDF" to be included in the list of printers you can select from. If you are on older versions of Windows you will need a third-party solution to add a PDF printer; there are a few around if you search for them. There are a bunch of Windows PDF tools (freeware and commercial) which allow to reorder PDF documents in various ways here. - If you search on Google after that topic you will probably find a lot of them. Hey thanks.I did not know such a thing existed. I have tried it and got the Argentine answer (i.e. 98% right, with a critical 2% missing). At present it is producing the right page pairs (I think), but my printer friend would prefer to have all the outers, then all the inners, if you know what I mean . I need to apply a couple of coats of thinking about it, but it is certainly far, far easier than trying to manually build the file. It avoids nearly all of the issues I have reported above. Many thanks. I am going to try working via the microsoft print to pdf. But those tolls may comeinhandy. 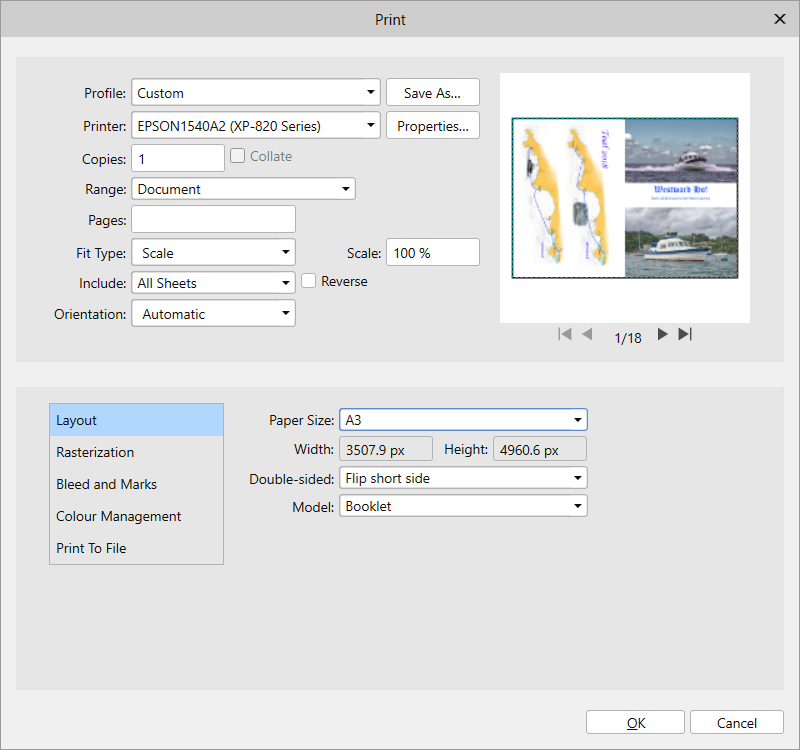 It is the same result as printing as a booklet in AFPub, just one pdf step in between – but less to carry to the printer. Thank-you for my morning chuckle.